Obituary by J.L.E. Dreyer (the author of the New General Catalogue, NGC) included in Report of the Council to the Seventieth Annual General Meeting (Monthly Notices 50, pp. 179182, February 1890). I have decided to enliven it by Tempel's drawing of the Merope nebula (NGC 1435) in the Pleiades, which originally accompanied his article in Monthly Notices 40, pp. 622623, Supp. 1880. Reproduced by permission of the Royal Astronomical Society. Ernst Wilhelm Leberecht Tempel was born on December 4, 1821, at Nieder-Kunersdorf, near Löbau, in the kingdom of Saxony. His parents were people in poor circumstances, and so he received but a scanty education, which in after years he lost no opportunity of improving. When about twenty years of age he went to Copenhagen, where he worked for about three years as a lithographer, and where his lively manners and his taste for music and art acquired for him many friends, some of whom he never lost sight of. After leaving Copenhagen he went for some time to Christiania, and his roving spirit then brought him to Italy, where he settled at Venice and exercised his art for many years. Having become interested in astronomy he purchased a 4-inch refractor by Steinheil, with which he began exploring the heavens. It was a great encouragement to him to persevere in this occupation (for which he had obtained leave to use the balcony of a Venetian palace), that on April 2, 1859, he succeeded in discovering a comet (1859 I), and thenceforth he remained an enthusiastic observer until his last illness. He was the first to notice (on October 19, 1859) the now well-known nebula around Merope in the Pleiades, the announcement of which, though confirmed by various observers with small instruments, was received with much hesitation, as the object was less readily seen with a larger aperture and higher power. In March 1860 Tempel went to Marseilles, where he obtained employment at the Observatory, which was then under the direction of Valz. He picked up his second comet (1860 IV.) in October 1860, and also turned his attention to the minor planets, of which he in the years 1861 to 1868 discovered five. He remained attached to the Observatory till towards the end of 1861, when he settled in the Rue Pythagore, Marseilles, and resumed his work as a lithographer. But Tempel continued to show himself an indefatigable observer, and as he had only his 4-inch refractor he was naturally induced to remain faithful to the field of work in which he had first been successful  that of comet-seeking. Among the eight comets which he found while at Marseilles,  the first one of 1866 attracted great attention from its connection with the November meteors, while the second one of 1867 was found to belong to the interesting class of periodic comets of short period. It was observed again in 1873 and 1879, but in 1885 was too distant and too faint to be seen. Comet 1869 III., which was also discovered by Tempel, was in 1880 found to be periodic; it is known as Tempel's third periodic comet, and passed the perihelion in May 1886, when it was too unfavourably situated to be observed. In January 1871 Tempel was as a German expelled from France by the Provisional Government. He went to Milan, where Professor Schiaparelli was glad to accept his services as an assistant at the Brera Observatory. There he continued observing comets, and discovered three new ones,  among which his second periodic comet (1873 II.) is remarkable as having a very short period  only a little over five years. It was observed again in 1878, but was unfavourably placed with regard to the earth both in 1883 and 1889. Tempel's observations made at Milan, chiefly of comets, were published in the Milan ephemeris for 1872 and in No. 5 of the Pubblicazioni of the Brera Observatory; in the latter there is a fine lithographed plate of the Pleiades with the Merope nebula, which he later improved by the addition of many minute stars, after which he republished it in the Monthly Notices, vol. xl. [See the figure  L. O.]. Towards the end of 1874 Tempel left Milan to accept the post of Assistant in charge of the Arcetri Observatory, which is connected with the Reale Instituto di studi superiori of Florence. Having now for the first time the use of larger instruments, he thenceforth devoted himself to observations of a more systematic character, and discovered only one more comet, 1877 V. In all he had been the first discoverer of thirteen comets (counting 1870 I., which was detected both by him and by Winnecke within a few minutes), while he found four which had been detected somewhat earlier by other observers,  and one cometary object (December 29, 1871) which could not be found again. The Observatory at Arcetri had been erected in the years 18691872 from the designs of Donati, but when this energetic astronomer died in September, 1873, the buildings, though externally finished, were not complete, and the mounting of the largest instrument  a refractor by Amici, of 11 inches aperture  was far from finished, so that there was neither clockwork nor graduations on the circles. The building seems also to have been badly constructed, as the walls of the meridian-room had to be stengthened in 1875 to prevent them from giving away. Nobody appears to have taken the slightest interest in the observatory after Donati's death, and for fourteen years Tempel had to struggle on, subsisting on a scanty salary, and endeavouring to do good work with a half-finished instrument. The years which Tempel had spent in comet-seeking had caused him to take a great interest in nebulae, and, notwithstanding all the obstacles with which he had to contend at Arcetri, he resolved to apply himself to observations of these objects. He had at his disposal two instruments with object-glasses by Amici, both of which were optically suitable for observing nebulae. One was a refractor of 9.4 inches aperture and 10.5 feet focal length, roughly mounted on a portable stand, but it does not appear to have been much used, as a slight wind was sufficient to set it in motion on the sloping terrace, which was the only place where it could be used. The other refractor has 11 inches aperture and 17.5 feet focal length, and is equatorially mounted under the central dome; but mounting and dome have been so badly designed that objects in altitudes less than 20° cannot be observed. Undaunted by these difficulties, Tempel collected a considerable number of observations of nebulae. Many of his results have appeared in a series of notes in the Astronomische Nachrichten (vols. 90113), from which it may be seen that a great number of objects not observed elsewhere since Sir W. Herschel's time have been examined and their places corrected, and many new nebulae found and micrometrically observed. But, above all, Tempel devoted his attention to the making of accurate drawings of the more interesting nebulae, a pursuit for which his artistic skill and experience made him particularly fitted; while he had also the advantage of a very pure sky and an instrument of sufficient aperture and excellent defining power. A photographic reproduction of a drawing of the nebula of Orion will be found in a short memoir on nebulae printed in 1885 in the Abhandlungen der K. Böhmischen Gesellschaft der Wissenschaften (revieved in the Vierteljahrsschrift, vol. xxii.). A list of the drawings made at Arcetri was given in the same memoir, comprising 186 nebulae, or groups of nebulae. It would appear that steps were taken some years ago to have these drawings published, as Tempel in 1886 sent the writer of these lines a lithographed plate, which he described as a failure, adding: It belongs to my Roman work on nebulae (22 plates), which unfortunately will probably never be published, as we hitherto have not found an artist capable of copying my nebulae. It is very much to be hoped that this work may be published, together with Tempel's numerous notes and measures (with an annular micrometer) of neighbouring stars and companion nebulae. In the beginning of 1887, when he found himself unable to observe, Tempel began to arrange and put in order his scattered notes and sketches, many of which has as yet only been jotted down on various maps, and intended to enter them all in a copy of Herschel's General Catalogue, interleaved with two white leaves betwen each two pages, but we are not aware whether he succeeded in completing this task. We trust, however, that his Italian confrères will not allow his work to be buried in oblivion, but that they will interest themselves in having it published in the same systematic and complete manner in which the obsevations of Dembowski were given to the world some years ago. Tempel's mind, which always has been somewhat inclined to melancholy, had in Italy found peace by embracing the Roman Catholic faith. About the end of 1886 he was attacked by a liver complaint, and some months later by partial paralysis. He lingered till March 16, 1889, when death relieved him from his sufferings. His mind remained clear to the last. He was buried near the tomb of Donati, his predecessor in charge of the Arcetri Observatory. In addition to various prizes from the Vienna Academy for his discoveries of comets, Tempel, in 1879, received the prize which every six years is awarded by the Accademia dei Lincei for some astronomical work. He was elected a Foreign Associate of this Society June 10, 1881. 1860 IV., 1863 IV., 1864 II., 1866 I., 1867 II., 1869 II., 1869 III., 1870 I. 1871 II., 1871 IV., 1873 II. These are: 1862 II., 1863 III., 1867 I., and 1874 II. 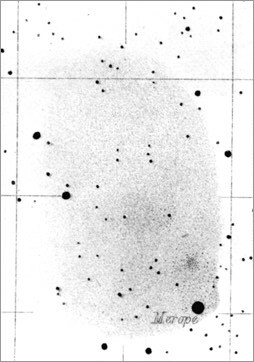 A drawing of the Orion nebula, in 1861, drawn and lithographed by Tempel, appeared in the Ast. Nach., vol. 58.